Born at Winnipeg on 30 September 1917, son of Louis Hatskin (1885-1965) and Henya “Ann” Hatskin (?-1972), he was educated at Ralph Brown School and St. John’s High School, and attended the University of Oklahoma on a football scholarship. He played for the Winnipeg Blue Bombers (1936-1941), participating in two Grey Cup games. 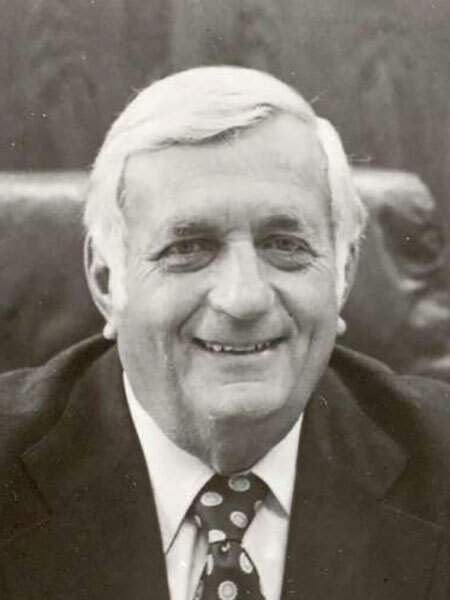 He took on the family corrugated carton and wood businesses, and developed interests in timber, real estate, container, property management, and investment firms. He owned race horses in Florida and Illinois and, in 1959, his investment yielded a Louisiana Derby victory. He was a co-founder of the World Hockey Association and the Winnipeg Jets, bringing Bobby Hull’s hockey services to the Jets for a large dollar contract. He served as Chair of the WHA from 1975 to 1979 and merged it with the NHL. During the days of the WHA, the Ben Hatskin Trophy was awarded to the league’s top goalie. In 1985, he was inducted into the Manitoba Sports Hall of Fame. He died at the Health Sciences Centre on 18 October 1990 and was buried in the Rosh Pina Memorial Park. He was inducted posthumously into the Winnipeg Citizens Hall of Fame. “Palynch is third in Florida derby,” Winnipeg Free Press, 6 April 1959, page 26. Obituary [Louis Hatskin], Winnipeg Free Press, 4 August 1965, page 28. Obituary [Henya Hatskin], Winnipeg Free Press, 16 October 1972, page 31. “Jets legend Hatskin dies at 73,” Winnipeg Free Press, 19 October 1990, page 59. Obituary, Winnipeg Free Press, 21 October 1990, page 26. Obituary [Cecille Hatskin], Winnipeg Free Press, 13 July 2005, page 36. We thank Malcolm Woligrocki for providing additional information used here.